Well I'm back after a very relaxing 2 weeks at the cabin.....I was so relaxed that I didn't even manage to get a post up. But all good things come to an end and it's time to start getting ready for a new (whisper it now so the kids don't hear) school year! 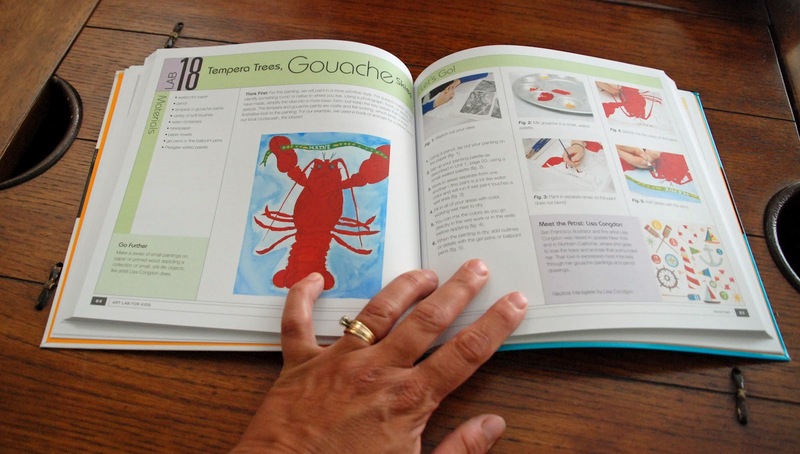 One of the first things I need to do is order supplies which includes any new instructional books and I have a perfect one to recommend this year. 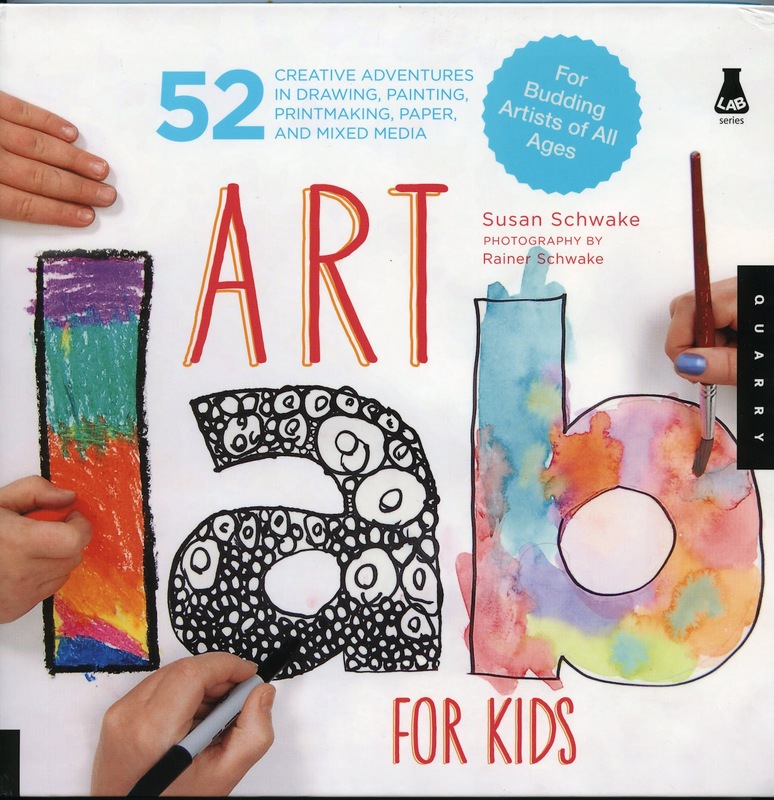 Art Lab for Kids by Susan Schwake is a pretty amazing little book. I have 2 other "Lab" books and I originally thought this would just be a simplified version for kids, but this book has tons of great ideas! There are 52 projects but Susan doesn't stop there as every project presented has a "Go Further" section with ideas for extra projects using the variations of the same technique. Each project also has a materials list , a large photo of the finished project, 2-5 pictures of the process and step by step instructions. Susan also includes an artist bio as each project is inspired by by the work of a contemporary artist. Almost ever project is paper based so no need for special materials. I think it's a great addition to any art program. If you would like to win your own copy check out the details at the end of this post. Now onto the silk screening project which is based on the project in the book. You need an embroidery hoop, plastic or wood. The plastic ones are more durable but cost more. You can use screen filler, Mod Podge, on water resistant glue. 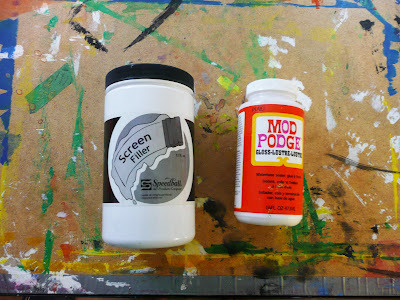 For this project I'm using Mod Podge. Before you start you want to practice making your design. 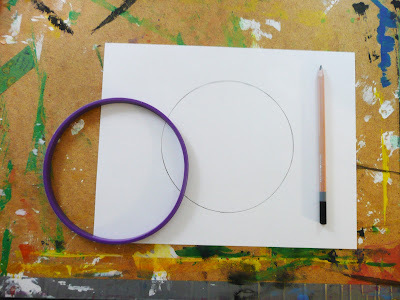 Take the inner hoop and place on some paper, trace out from the inside with pencil. Insert your gauze like material. Make sure it is taut. I buy what is on sale and it doesn't need to be silk. I find some great material in the drapery section for this. 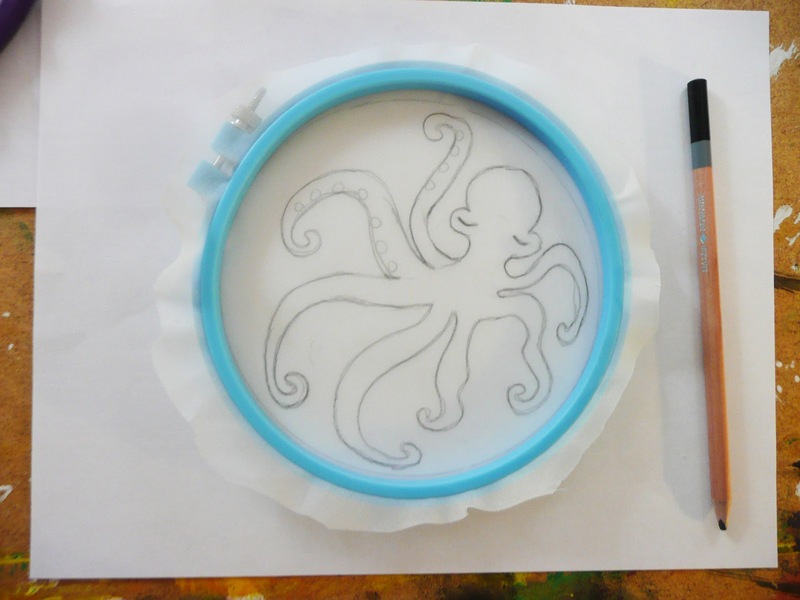 Place your hoop with the gauze fabric down on top of your sketch. The fabric is directly on the paper. You can see the design thru the fabric. Go over your lines with pencil right on the fabric. Turn over the hoop so the fabric side is facing up. 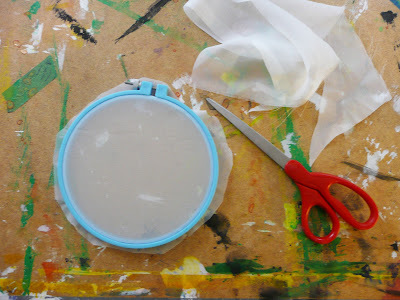 With a small brush and a little Mod Podge start painting in all the areas and detail that you want to stay white. When dry place the hoop onto the paper or fabric you want to print on. If you are printing onto fabric use acrylic paint. You want the fabric touching the paper. I'm using acrylic paint. 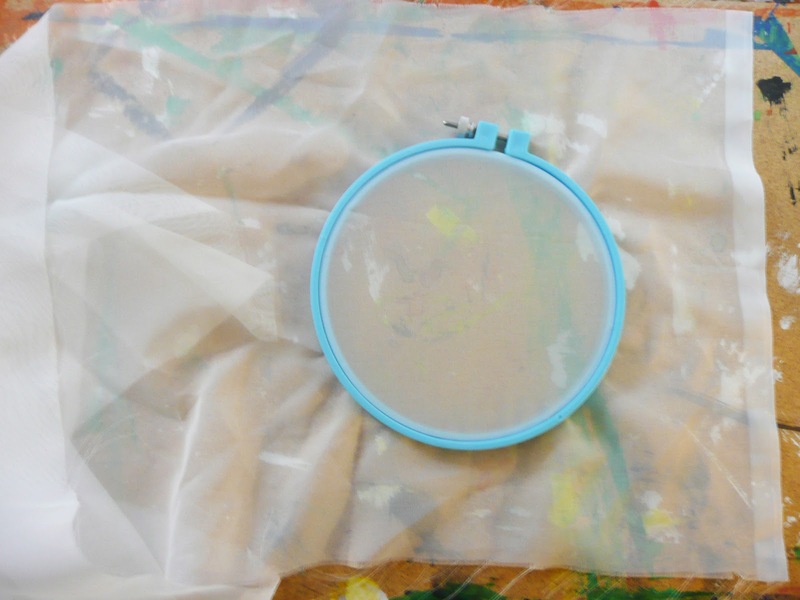 Holding the hoop down with one hand, you don't want it to shift, paint over the gauze. Carefully lift off the hoop and you can see your print. 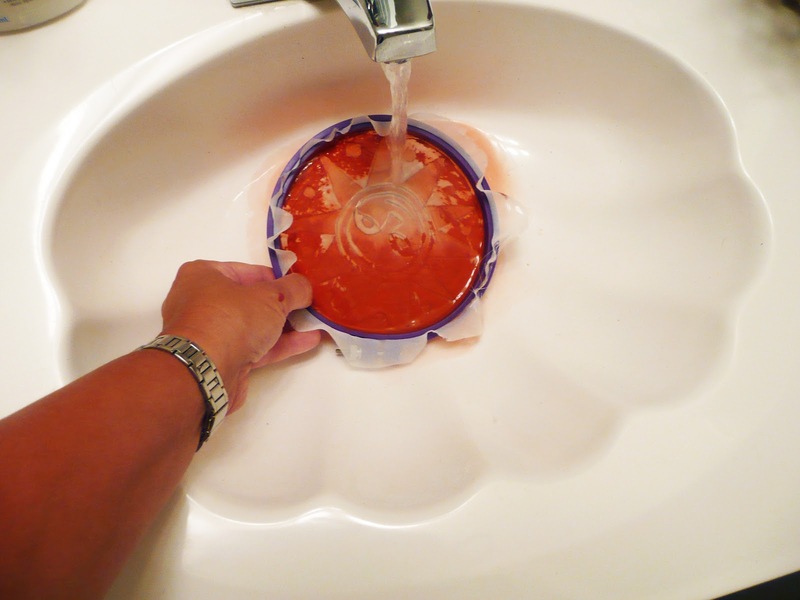 Before the paint dries on the screen wash gently with water. No hard scrubbing. Let the screen air dry fully, don't blot with a towel as you might disturb the design. You now can use your screen again with another color. Get your entry in by 11:59pm Thursday night and I will make the draw Friday Aug 24/12. Canadian and US entries only. Good luck everyone and thanks Quarry Books for sponsoring this giveaway! Love the silkscreening project and would love the book! That silk screening project looks so easy and fun. I really want to give that a try. 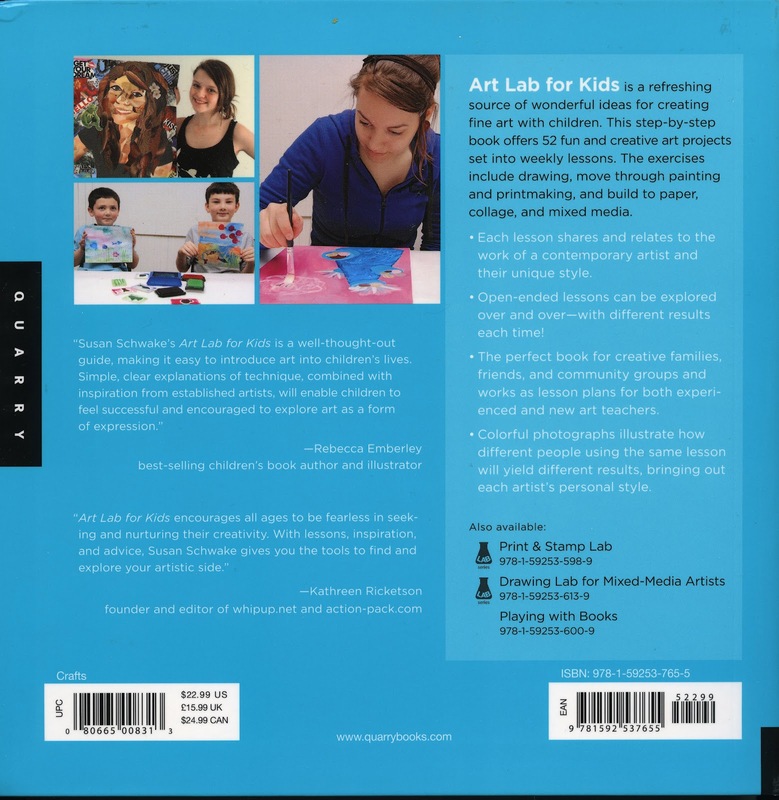 Art Lab for Kids looks like an awesome book I would love to try with my kids. 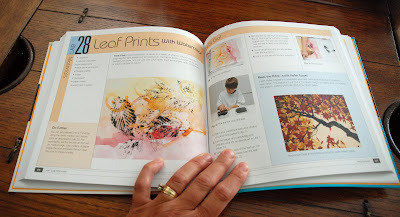 I have a couple of the other "Art Lab" books and love them. Thanks for the opportunity! How wonderful to read all you've shared on this book. I am a constant borrower & renewer as many times as they will let me! I've had Drawing Lab out twice Now in 2012 for 3 months each time!! Today I had to turn it and Collage Lab back in but guess what had come in and I got to check out FIRST of anyone?! Art Lab For Kids!! It is sensational and I had a good hours ride back on the bus to marinate in it!! I found 2 older art for kids books at the Habitat for Humanity ReStore last week. 25 cents each!! I don't think that will happen with this one though!!! I am working toward a wee gig as an afterschool teacher as I am on disability, and I wanted to scour all the ideas I could find to try putting together a curriculum. When I was teaching a combined 1-3 and 2-4 class I was creating my curriculum materials all the time and this seems a fun way to prepare for this job I hope to find in the next month or 2. Anyhow, I will hush and so appreciated your featuring this extraordinary book here!! This is very cool. I am inspired by the fact you are still working so hard even though it's summer! Oh, how I would LOVE to have that book. 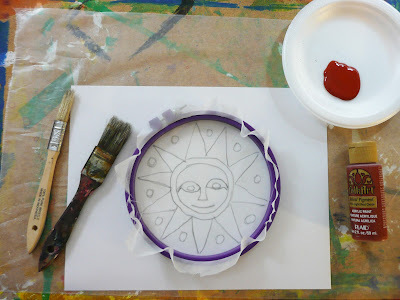 I do lots of art activities at the nature center where I work and these would be so much fun to do. Thanks for the opportunity to win this book! I love it. I would enjoy using it in our homeschool this year. Great idea! 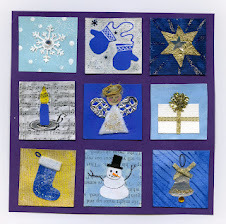 Thanks for all the wonderful blog posts! Wow this looks like such a great project! I think I'd have as much fun as them doing it. I'd love to have this book to use with my daughters. Thanks for the serigraphy how-to, looks doable! I haven't read a "lab" book, so I would love to be introduced to a new series. What a great project and a great book! Love the link to great art as well in the book. I noticed this book several months ago, along with the other Lab books. I didn't get a chance to look at it in person but I put it on my Amazon wish list immediately. It was great to read your review of it and hear now good it is. Thank you! I'm on the hunt for great projects to improve my elementary art curriculum and to create a kindergarten one so this book would come in very handy. This sounds like a great book! 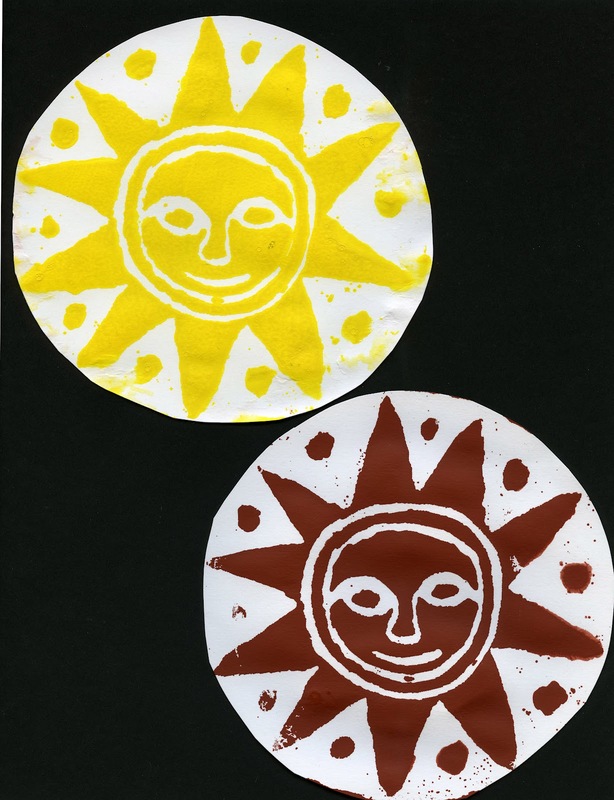 My daughter would really enjoy trying out the projects (and learning about the artists). Hope I win! I would love to have that book! I've flipped through it at the book store, but haven't gotten around to buying it. Love the silkscreen. I JUST put this book in my Amazon cart last night. I have another drawing lab book that I love. Thanks for the tutorial -- looks very do-able!!! The book sounds like a great resource!! Looks like a fabulous book. I was just introduced to this silk-screening technique at a workshop this summer. Such fun! I really want to try this project, thank you! And thank you for the giveaway! This book looks fabulous! And it would especially be handy for me since I work at a Boys & Girls Club and have kids from Kindergarten to middle school all in one room working on projects. It's always nice to have a way that older kids can take a project to the next level. Thanks for having the giveaway! Wow! Can it really be that easy. Would love to try this and check out the book. My students would love these projects! What a great project! I would love this book also for our homeschool curriculum. It sounds like a great book! Thank you for the chance to win it. Well, that just looks fun! The book looks wonderful! 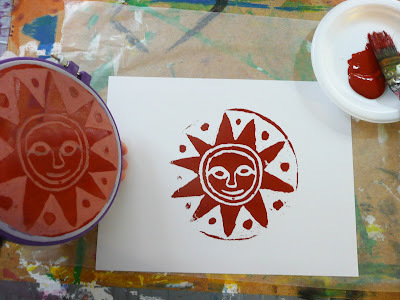 Nice intro to screen printing for children. The book looks really interesting as well! This project looks great! I can hardly wait to get the materials and begin. Thanks for posting it and the new book offer. Hope you had a great vacation! I would love to get my hands on that book :) so many great art adventures insides! My kids and I checked this book out at our local library this summer, it is amazing! We hope we win so we can have our own copy! Thank you for this idea and for introducing me to this book! 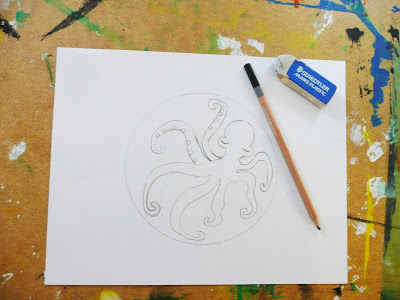 I am a homeschooler and plan to use your blog/art projects and lessons as my art curriculum for this year. I recommend your blog to other homeschoolers! Thanks for the inspiration. 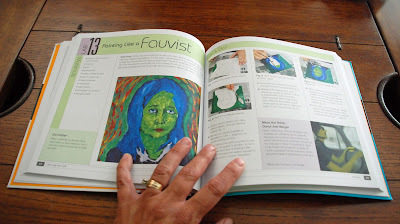 My daughter loves art projects, this book looks like it has some wonderful activities. Another great project me and my boys will have to try. I would love to win this book! Thanks so much for all your great ideas and give aways!! Great post Gail...thanks again for sharing. Would love the book! Another great idea and book source...thanks Gail! Well, I entered into my Amazon wish list! 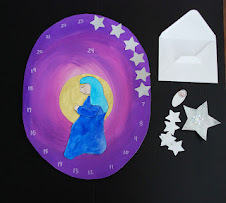 I've used your site to develop an art curriculum for our little homeschool this year. I'll try to send you photos as we go. Thank you so much for the hours and hours you have put into this site. So very grateful. I'd love to own the book. Thanks so much for your blog. It has provided inspiration and hours of art fun for me and my children. I would love this book! It sounds fantastic. If I don't win it, I'll buy it for sure! 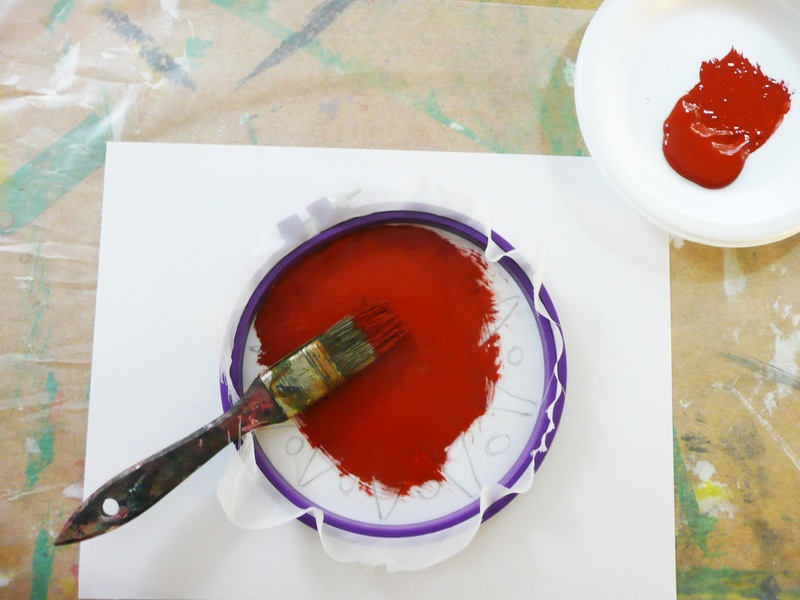 Enjoy restocking your art room! We are counting down to the beginning of school around here and Art Lab for Kids looks like a great way to distract until first day lift off! You make silk screening look so easy. I may actually try it with the students this year. Would love to win that great book, too! Thanks for sharing!! That book looks wonderful! Would love to try it! I'd love to win this- it looks great! Ooh, really love this project, especially the bold colors! I would really like to try this with my students. Thanks for the giveaway--looks like a great book! Oh, wow, that looks like a must have book. Please enter me. It would be great to have some new ideas for working with kids. The one you picked to share is awesome! I would love to win this book. I love the simplicity of the projects. I would love to have that book in my collection! Oh, please enter me in the book giveaway!That book looks great! Thanks! This looks like a very interesting book. I have 3 elementary aged grandchildren and I'd love to have this book to share all the neat ideas with them. I have the other art Lab Books and I have to agree with you, they are pretty fabulous! 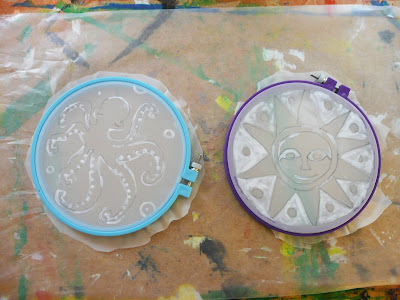 I am always on the lookout for fun and out of the box ideas to get my kids into the studio for some Art making FUN. I would LOVE to win this book and add to my collection. I would love to win this book. I homeschool my 2 girls and we are going to do more art this year. This book will help. Art Club wouldn't be the same without a book like this! I hope I win! My boys would really enjoy this project! The books sounds wonderful. Thanks. Thanks for the tip on this book! Perfect for my second grade son. Please enter me in the giveaway. What a wonderful sounding book. I'd love to introduce this to my gifted and talented fourth graders! I would love to win. 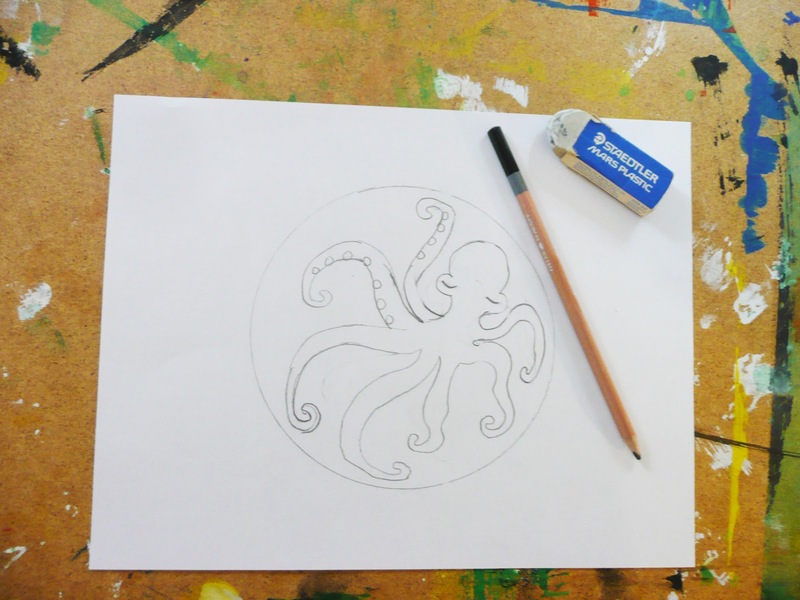 I am teaching a high school homeschooled art class. We would greatly benefit! I love this book! If I don't win it, I will have to buy it later. If I do win it, I will probably buy another copy for my grandchildren. Thank you for the chance to win! Thank you so much for this post. 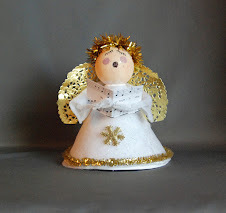 I want to let you know that I posted a link to your blog in Creative Busy Bee Craft Inspirations, under the Page 1 post on Aug. 30, 2012. Thanks again. 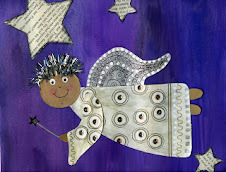 Hi I LOVE this project and want to use on 3rd graders. 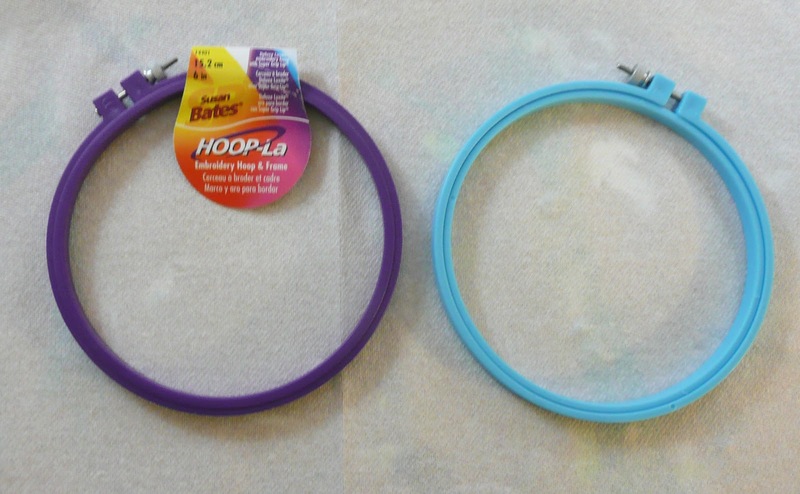 Do you think wooden embroidery hoops would be ok to use? I'm sure the wooden ones would be fine as well. 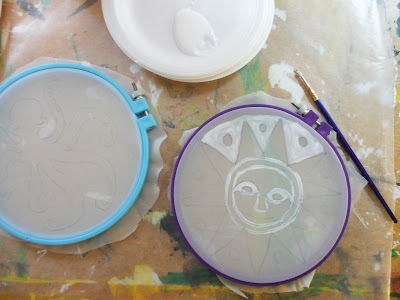 Only thing you might want to do is remove from hoop if washing out the paint to re-use the serigraph with a different colour, so your hoop doesn't warp. Good luck it's one of my favourites!